VFL: Round twelve win in 60 seconds Watch highlights from Collingwood's 26-point win over Richmond in round twelve of the VFL. 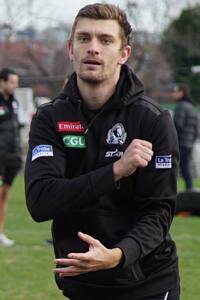 Adam Oxley warms up before Collingwood's VFL clash with Richmond at Victoria Park. The VFL Magpies built on a dominant three quarters of football to beat Richmond 14.12 (96) to 10.10 (70) at Victoria Park on Sunday. Collingwood fans were treated to a convincing display for the majority of the clash at the club's traditional home. Lachlan Howe had a first half to remember, kicking three goals and setting up another as the Pies raced to a 36-point lead. Jarrod Witts picked up where his fellow tall left off, while a backline consisting of Ryan Pendlebury, Adam Oxley, Alan Toovey and Tyson Goldsack prevented a number of Richmond attacks. Oxley joined Rupert Wills and Matthew Goodyear as leading possession getters, while Ben Moloney and Jack Hellier added multiple goals. 2:10PM - Welcome to Collingwood Media's coverage of today's VFL at Victoria Park. Today we take on the Tigers, a team sitting in 13th position on the VFL ladder. As for the Magpies, we've won four games in a row and will look to use today as an opportunity to find a place in the top four. 2:14PM - Adam Oxley one of ten AFL-listed players representing the VFL Magpies today. Another of note is Jarrod Witts. Ivan Maric has been withdrawn from Richmond's final side, meaning we won't get to see the highly-anticipated match-up of Witts-Maric. 2:15PM - Collingwood kicking to the Yarra Falls end of the ground in this first term. The Magpies have had the entirity of possession in their half early. 2:20PM - Two early goals on the board for the home side. Lachie Howe adds another at the Yarra Falls end of the ground. Richmond yet to take the ball into their forward half. 2:22PM - Richmond win the clearance after a second Lachlan Howe goal. Their first inside 50 ends in the hands of the ever reliable Jack Frost. 2:26PM - Ben Moloney kicks the fourth consecutive Collingwood goal. As we so often see, he celebrates by running straight to interchange bench for a breather. 2:28PM - He was named in the best for a solo ruck duty against Casey two weeks ago, now Lachie Howe is jumping out of the blocks once again. Kicked two goals and set up a third early in this one. 2:33PM - A week off seems to have done wonders for the VFL Magpies. High levels of intensity all over the ground as we lead Richmond 26-1. 2:34PM - Gus Borthwick stumbles to the interchange bench after copping a big hit in Collingwood's forward line. Meanwhile, Corey Gault's set shot misses to the right-hand side. 2:36PM - Set shot on the way from Ryan Bathie at the Sherrin Stand end. Richmond's first confident attack ends in a behind. 2:38PM - They make up for it with a quick goal. Turnover from the kick-in. Richmond goal. GOALS: Moloney 2, Howe 2, Gray. 2:53PM - Second quarter from Vic Park begins with a fantastic Tyson Goldsack tackle. Umpire pays holding the ball and the Pies move forward. 2:56PM - Lachie Howe kicks his third and the VFL Mapgies sixth. Having a day out. 2:58PM - Sweeping handball ends in the hands of Jordan Kelly. Richmond win possession and burst out of defence. 2:59PM - Arguably Richmond's strongest chain of play for the afternoon ends in a goal. Pies lead 39-22. 3:01PM - Behind to Richmond after the Tigers win a free kick inside 50. 3:04PM - Kelly, Pendlebury and Goldsack combine to clear the ball from defence. Gault kicks to an open 50, Ferguson shepards brilliantly... and Jack Hellier kicks an easy goal! 3:06PM - All seven VFL Magpies' goals have come from our VFL-listed players. Strong performances all over the ground as the Pies extend their quarter time lead. 3:08PM - Lachie Ferguson bringing plenty of energy to the VFL Magpies forward line. Every touch is gold as he constantly provides opportunities. 3:11PM - Tyson Goldsack has had a big second quarter in defence. He sends a long ball inside 50 as the Magpies once again attack at the Sherrin Stand end. 3:13PM - And speaking of, Ferguson almost adds a third straight off the ground. The little man wins front position but his shot skews to the right-hand side. 3:18PM - Set shot at the Sherrin Stand end and Angelo Rambaldi makes absolutely no mistake. A rare goal for the Eastern Football League graduate. 3:20PM - Half time siren sounds at Victoria Park. Collingwood 9.5 (59) lead Richmond 3.5 (23) at the main break. 3:40PM - Second half is underway at Victoria Park. Adam Oxley gets the scoring under with the first goal of the third term. 3:49PM - Just the one goal added to the tally ten minutes into the second half. Jarrod Witts with his hands on everything in this third term. 3:51PM - Just as was the case in the first term, Collingwood are keeping the ball well trapped at the Yarra Falls end of the ground in this third quarter. 3:53PM - Golds, Frost and Toovey link up in defence. Toovey is tackled high and wins the free kick at half back. 3:54PM - Free kick has been plucked out and given the way of Richmond. Andrew Moore's shot on goal is a shocker. Doesn't make the distance as play continues. 3:56PM - This time its Goldsack, Toovey and Oxley who stand up well in defence. The experienced trio is impressing here in the third. 3:58PM - Wills kicks inside 50 and finds Corey Gault on a strong lead. He's 40m out, directly in front... Set shot to follow. 3:58PM - Gault makes no mistake. Goal to the VFL Magpies. 4:00PM - Liam McBean gets one back at the Sherrin Stand end. First of the quarter for the Tigers as the lead is cut back to 47 points. 4:03PM - Lachlan Howe picks up where he left off in the first half. He marks strongly and delivers successfully to Rupert Wills. 4:06PM - Rupert Wills continues to impress. He's kicked his first of the day at the Yarra Falls end. Collingwood lead 87-31. 4:11PM - Three quarters down, one to go. The VFL Magpies hold a convincing lead at the final change. Our tally of 13.9 (87) leads Richmond's 4.7 (31). 4:16PM - Plenty of players impressing as the fourth quarter begins at Victoria Park. Witts in the ruck, Hellier at his feet. 4:20PM - Richmond get the first goal of the final term. Their coach Craig McRae told Channel 7 at three-quarter time that this is the most disappointed he's been in his players in 12 weeks. 4:22PM - Lachie Ferguson finds Campbell Lane inside 50. The Oakleigh Charger's shot falls short and the Tigers' defenders rush a behind. 4:23PM - A few players winning plenty of the footy through three quarters here at Victoria Park. 4:26PM - Richmond showing a bit of life as they kick their second goal of this final term. Lead is cut back to 44 points midway through the final term. 4:27PM - Collingwood retreat and assess options down back. Lane, Collopy, Borthwick run through the middle of the ground with a slick chain of handballs. It ends in the hands of Ferguson who kicks the GOAL! 4:32PM - Still plenty of sting in this one. Macaffer, Gault and Oxley want more of the action. All three make their way onto the ground after a quick spell on the bench. 4:34PM - Marcon adds a third goal for Richmond in this final term. Pies lead 95-51. 4:35PM - Nick Gray misses to the right-hand side. He can't add to his goal early in the first term. 4:36PM - Cal Matheson names Lachlan Howe, Adam Oxley, Alan Toovey, Ryan Pendlebury and Tyson Goldsack as his best performers. 4:38PM - Bit of feeling errupts at half-forward for the Magpies. Brent Macaffer is at the thick of it and clearly isn't happy with some treatment he's received. 4:39PM - Jordan Kelly running around with his jumper hanging by a thread. Doesn't seem to be worrying the former Hawk and Bulldog. So good seeing our #vflmagpies doing great out there!! 4:40PM - Set shot gives Richmond another late goal. Bathie kicks truly from deep in the pocket. 4:42PM - Lead cut back to 33 points and Richmond have another opportunity to cut that back even further. Goal to Moore as his set shot goes through. 4:44PM - 26 minutes gone in this final term. Shouldn't be long remaining as the VFL Magpies limp to their fifth consecutive victory. 4:46PM - Siren sounds at Victoria Park! The last quarter wasn't as pretty as the first three, but a strong effort all the same. Collingwood defeat Richmond 14.12 (96) to 10.10 (70).